"Home School" redirects here. For the novel, see Home School (novel). Homeschooling, also known as home education is the education of children at home or a variety of other places. Home education is usually conducted by a parent or tutor or online teacher. Many families use less formal ways of educating. "Homeschooling" is the term commonly used in North America, whereas "home education" is commonly used in the United Kingdom, Europe, and in many Commonwealth countries. Before the introduction of compulsory school attendance laws, most childhood education was done by families and local communities. In many developed countries, homeschooling is a legal alternative to public and private schools. In other nations, homeschooling remains illegal or restricted to specific conditions, as recorded by homeschooling international status and statistics. According to the US National Center for Education Statistics, about three percent of all children in the US were homeschooled in 2011–2012 school year. The study found that 83 percent were White, 5 percent were Black, 7 percent were Hispanic, and 2 percent were Asian or Pacific Islander. As of 2016, there are about 1.7 million homeschooled students in the United States. On average, homeschoolers score at or above the national average on standardized tests. Homeschool students have been accepted into many Ivy League universities. 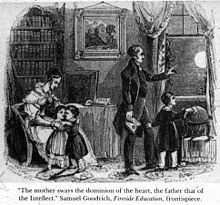 For most of history and in different cultures, the education of children at home by family members was a common practice. Enlisting professional tutors was an option available only to the wealthy. Homeschooling declined in the 19th and 20th centuries with the enactment of compulsory attendance laws. But, it continued to be practiced in isolated communities. Homeschooling began a resurgence in the 1960s and 1970s with educational reformists dissatisfied with industrialized education. The earliest public schools in modern Western culture were established during the reformation with the encouragement of Martin Luther in the German states of Gotha and Thuringia in 1524 and 1527. From the 1500s to 1800s the literacy rate increased until a majority of adults were literate; but, development of the literacy rate occurred before the implementation of compulsory attendance and universal education. Home education and apprenticeship continued to remain the main form of education until the 1830s. However, in the 18th century, the majority of people in Europe lacked formal education. Since the early 19th century, formal classroom schooling became the most common means of schooling throughout the developed countries. In 1647, New England provided compulsory elementary education. Regional differences in schooling existed in colonial America. In the south, farms and plantations were so widely dispersed that community schools such as those in the more compact settlements of the north were impossible. In the middle colonies, the educational situation varied when comparing New York with New England. Most Native American tribal cultures traditionally used home education and apprenticeship to pass knowledge to children. Parents were supported by extended relatives and tribal leaders in the education of their children. The Native Americans vigorously resisted compulsory education in the United States. In the 1960s, Rousas John Rushdoony began to advocate homeschooling, which he saw as a way to combat the secular nature of the public school system in the United States. He vigorously attacked progressive school reformers such as Horace Mann and John Dewey, and argued for the dismantling of the state's influence in education in three works: Intellectual Schizophrenia, The Messianic Character of American Education, and The Philosophy of the Christian Curriculum. Rushdoony was frequently called as an expert witness by the Home School Legal Defense Association (HSLDA) in court cases. He frequently advocated the use of private schools. Their primary assertion was that the bonds and emotional development made at home with parents during these years produced critical long-term results that were cut short by enrollment in schools, and could neither be replaced nor corrected in an institutional setting afterward. Recognizing a necessity for early out-of-home care for some children, particularly special needs and impoverished children and children from exceptionally inferior homes[clarification needed], they maintained that the vast majority of children were far better situated at home, even with mediocre parents, than with the most gifted and motivated teachers in a school setting. They described the difference as follows: "This is like saying, if you can help a child by taking him off the cold street and housing him in a warm tent, then warm tents should be provided for all children – when obviously most children already have even more secure housing." The Moores embraced homeschooling after the publication of their first work, Better Late Than Early, in 1975, and became important homeschool advocates and consultants with the publication of books such as Home Grown Kids (1981), and Homeschool Burnout. Simultaneously, other authors published books questioning the premises and efficacy of compulsory schooling, including Deschooling Society by Ivan Illich in 1970 and No More Public School by Harold Bennet in 1972. In 1976, educator John Holt published Instead of Education; Ways to Help People Do Things Better. In its conclusion, he called for a "Children's Underground Railroad" to help children escape compulsory schooling. In response, Holt was contacted by families from around the U.S. to tell him that they were educating their children at home. In 1977, after corresponding with a number of these families, Holt began producing Growing Without Schooling, a newsletter dedicated to home education. Holt was nicknamed the "father of home schooling." Holt later wrote a book about homeschooling, Teach Your Own, in 1981. "I want to make it clear that I don't see homeschooling as some kind of answer to badness of schools. I think that the home is the proper base for the exploration of the world which we call learning or education. Home would be the best base no matter how good the schools were." One common theme in the homeschool philosophies of both Holt and that of the Moores is that home education should not attempt to bring the school construct into the home, or a view of education as an academic preliminary to life. They viewed home education as a natural, experiential aspect of life that occurs as the members of the family are involved with one another in daily living. When homeschooling is a choice, families have different reasons for choosing it. Parents commonly cite two main motivations for homeschooling their children: dissatisfaction with the local schools and the interest in increased involvement with their children's learning and development. Parental dissatisfaction with available schools typically includes concerns about the school environment, the quality of academic instruction, the curriculum, bullying, racism and lack of faith in the school's ability to cater to their children's special needs. Some parents homeschool in order to have greater control over what and how their children are taught, to cater more adequately to an individual child's aptitudes and abilities, to provide instruction from a specific religious or moral position, and to take advantage of the efficiency of one-to-one instruction and thus allow the child to spend more time on childhood activities, socializing, and non-academic learning. Some African-American families choose homeschool as a way of increasing their children's understanding of African-American history – such as the Jim Crow laws that resulted in their ancestors being beaten, killed, or sold for learning to read – and to limit the harm caused by the unintentional and sometimes subtle systemic racism that affects most American schools. Some parents have objections to the secular nature of public schools and homeschool in order to give their children a religious education. Use of a religious curriculum is common among these families. Recent sociological work suggests that an increasing number of parents are choosing homeschooling because of low academic quality at the local schools, or because of bullying or health problems. Homeschooling may also be a factor in the choice of parenting style. Homeschooling can be a matter of consistency for families living in isolated rural locations, for those temporarily abroad, and for those who travel frequently. Many young athletes, actors, and musicians are taught at home to accommodate their training and practice schedules more conveniently. Homeschooling can be about mentorship and apprenticeship, in which a tutor or teacher is with the child for many years and becomes more intimately acquainted with the child. Homeschooling increased in popularity in the United States during the 2000s; the percentage of children ages 5 through 17 who were homeschooled increased from 1.7% in 1999 to 3% in 2011/12. Homeschooling can be used a form of supplemental education and as a way of helping children learn under specific circumstances. The term may also refer to instruction in the home under the supervision of correspondence schools or umbrella schools. Some jurisdictions require adherence to an approved curriculum. A curriculum-free philosophy of homeschooling is sometimes called "unschooling", a term coined in 1977 by American educator and author John Holt in his magazine, Growing Without Schooling. The term emphasizes the more spontaneous, less structured learning environment in which a child's interests drive his pursuit of knowledge. Some parents provide a liberal arts education using the trivium and quadrivium as the main models. Homeschools use a wide variety of methods and materials. Families choose different educational methods, which represent a variety of educational philosophies and paradigms. Some of the methods or learning environments used include Classical education (including Trivium, Quadrivium), Charlotte Mason education, Montessori method, Theory of multiple intelligences, Unschooling, Radical Unschooling, Waldorf education, School-at-home (curriculum choices from both secular and religious publishers), A Thomas Jefferson Education, unit studies, curriculum made up from private or small publishers, apprenticeship, hands-on-learning, distance learning (both online and correspondence), dual enrollment in local schools or colleges, and curriculum provided by local schools and many others. Some of these approaches are used in private and public schools. Educational research and studies support the use of some of these methods. Unschooling, natural learning, Charlotte Mason Education, Montessori, Waldorf, apprenticeship, hands-on-learning, unit studies are supported to varying degrees by research by constructivist learning theories and situated cognition theories. [clarification needed] Elements of these theories may be found in the other methods as well. Individual governmental units, e.g. states and local districts, vary in official curriculum and attendance requirements. As a subset of homeschooling, informal learning happens outside of the classroom, but has no traditional boundaries of education. Informal learning is an everyday form of learning through participation and creation, in contrast with the traditional view of teacher-centered learning. The term is often combined with non-formal learning, and self-directed learning. Informal learning differs from traditional learning since there are no expected objectives or outcomes. From the learner's standpoint, the knowledge that they receive is not intentional. Anything from planting a garden to baking a cake or even talking to a technician at work about the installation of new software, can be considered informal learning. The individual is completing a task with different intentions, but ends up learning skills in the process. Children watching their tomato plants grow will not generate questions about photosynthesis but they will learn that their plants are growing with water and sunlight. This leads them to have a base understanding of complex scientific concepts without any background studying. The recent trend of homeschooling becoming less stigmatized has been in connection with the traditional waning of the idea that the state needs to be in primary and ultimate control over the education and upbringing of all children to create future adult citizens. This breeds an ever-growing importance on the ideas and concepts that children learn outside of the traditional classroom setting, including Informal learning. Depending on the part of the world, informal learning can take on many different identities and has differing cultural importances. Many ways of organizing homeschooling draw on apprenticeship qualities and on non-western cultures. In some South American indigenous cultures, such as the Chillihuani community in Peru, children learn irrigation and farming technique through play, advancing them not only in their own village and society, but also in their knowledge of realistic techniques that they will need to survive. In Western culture, children use informal learning in two main ways. The first as talked about, is through hands-on experience with new material. The second is asking questions to someone who has more experience than they have (i.e. parents, elders). Children's inquisitive nature is their way of cementing the ideas they have learned through exposure informal learning. It is a more casual way of learning than traditional learning and serves the purpose of taking in information any which way they can. All other approaches to homeschooling are subsumed under two basic categories: structured and unstructured homeschooling. Structured homeschooling includes any method or style of home education that follows a basic curriculum with articulated goals and outcomes. This style attempts to imitate the structure of the traditional school setting while personalizing the curriculum. Unstructured homeschooling is any form of home education where parents do not construct a curriculum at all. Unschooling, as it is known, attempts to teach through the child's daily experiences and focuses more on self-directed learning by the child, free of textbooks, teachers, and any formal assessment of success or failure. All-in-one homeschooling curricula (variously known as "school-at-home", "the traditional approach", "school-in-a-box" or "The Structured Approach"), are instructionist methods of teaching in which the curriculum and homework of the student are similar or identical to those used in a public or private school. Purchased as a grade level package or separately by subject, the package may contain all of the needed books, materials, tests, answer keys, and extensive teacher guides. These materials cover the same subject areas as public schools, allowing for an easy transition into the school system. These are among the more expensive options for homeschooling, but they require minimal preparation and are easy to use. Some localities provide the same materials used at local schools to homeschoolers. The purchase of a complete curriculum and their teaching/grading service from an accredited distance learning curriculum provider may allow students to obtain an accredited high school diploma. Some degree of autonomous learning is popular with those who home educate their children. In true autonomous learning, the child usually gets to decide what projects they wish to tackle or what interests to pursue. In home education, this can be instead of or in addition to regular subjects like doing math or English. A homeschool cooperative is a cooperative of families who homeschool their children. It provides an opportunity for children to learn from other parents who are more specialized in certain areas or subjects. Co-ops also provide social interaction. They may take lessons together or go on field trips. Some co-ops also offer events such as prom and graduation for homeschoolers. According to the Home School Legal Defense Association (HSLDA) in 2004, "Many studies over the last few years have established the academic excellence of homeschooled children." Home Schooling Achievement, a compilation of studies published by the HSLDA, supported the academic integrity of homeschooling. This booklet summarized a 1997 study by Ray and the 1999 Rudner study. The Rudner study noted two limitations of its own research: it is not necessarily representative of all homeschoolers and it is not a comparison with other schooling methods. Among the homeschooled students who took the tests, the average homeschooled student outperformed his public school peers by 30 to 37 percentile points across all subjects. The study also indicates that public school performance gaps between minorities and genders were virtually non-existent among the homeschooled students who took the tests. A survey of 11,739 homeschooled students conducted in 2008 found that, on average, the homeschooled students scored 37 percentile points above public school students on standardized achievement tests. This is consistent with the 1999 Rudner study. However, Rudner said that these same students in public school may have scored just as well because of the dedicated parents they had. The Ray study also found that homeschooled students who had a certified teacher as a parent scored one percentile lower than homeschooled students who did not have a certified teacher as a parent. Another nationwide descriptive study conducted by Ray contained students ranging from ages 5–18 and he found that homeschoolers scored in at least the 80th percentile on their tests. In 2011, a quasi-experimental study was conducted that included homeschooled and traditional public students between the ages of 5 and 10. It was discovered that the majority of the homeschooled children achieved higher standardized scores compared to their counterparts. However, Martin-Chang also found that unschooling children ages 5–10 scored significantly below traditionally educated children, while academically oriented homeschooled children scored from one half grade level above to 4.5 grade levels above traditionally schooled children on standardized tests (n=37 home schooled children matched with children from the same socioeconomic and educational background). Homeschooled children may receive more individualized attention than students enrolled in traditional public schools. A 2011 study suggests that a structured environment could play a key role in homeschooler academic achievement. This means that parents were highly involved in their child's education and they were creating clear educational goals. In addition, these students were being offered organized lesson plans which are either self-made or purchased. A study conducted by Ray (2010), indicates that the higher the level of parents' income, the more likely the homeschooled child is able to achieve academic success. In the 1970s, Raymond and Dorothy Moore conducted four federally funded analyses of more than 8,000 early childhood studies, from which they published their original findings in Better Late Than Early, 1975. This was followed by School Can Wait, a repackaging of these same findings designed specifically for educational professionals. They concluded that, "where possible, children should be withheld from formal schooling until at least ages eight to ten." Their reason was that children "are not mature enough for formal school programs until their senses, coordination, neurological development and cognition are ready". They concluded that the outcome of forcing children into formal schooling is a sequence of "1) uncertainty as the child leaves the family nest early for a less secure environment, 2) puzzlement at the new pressures and restrictions of the classroom, 3) frustration because unready learning tools – senses, cognition, brain hemispheres, coordination – cannot handle the regimentation of formal lessons and the pressures they bring, 4) hyperactivity growing out of nerves and jitter, from frustration, 5) failure which quite naturally flows from the four experiences above, and 6) delinquency which is failure's twin and apparently for the same reason." According to the Moores, "early formal schooling is burning out our children. Teachers who attempt to cope with these youngsters also are burning out." Aside from academic performance, they think early formal schooling also destroys "positive sociability", encourages peer dependence, and discourages self-worth, optimism, respect for parents, and trust in peers. They believe this situation is particularly acute for boys because of their delay in maturity. The Moores cited a Smithsonian Report on the development of genius, indicating a requirement for "1) much time spent with warm, responsive parents and other adults, 2) very little time spent with peers, and 3) a great deal of free exploration under parental guidance." Their analysis suggested that children need "more of home and less of formal school", "more free exploration with... parents, and fewer limits of classroom and books", and "more old fashioned chores – children working with parents – and less attention to rivalry sports and amusements." Along with positive school outcomes, homeschooled youth are also less likely to use and abuse illicit substances and are more likely to disapprove of using alcohol and marijuana. There are claims that studies showing that homeschooled students do better on standardized tests do not compare with mandatory public-school testing. Some advocates of homeschooling and educational choice counter with an input-output theory, pointing out that home educators expend only an average of $500–$600 a year on each student (not counting the cost of the parents' time), in comparison to $9,000–$10,000 (including the cost of staff time) for each public school student in the United States, which suggests home-educated students would be especially dominant on tests if afforded access to an equal commitment of tax-funded educational resources. Opposition to homeschooling comes from some organizations of teachers and school districts. The National Education Association, a United States teachers' union and professional association, opposes homeschooling. Homeschooling is legal in some countries. Countries with the most prevalent home education movements include Australia, Canada, New Zealand, the United Kingdom, Mexico, Chile and the United States. Some countries have highly regulated home education programs as an extension of the compulsory school system; others, such as Sweden, Germany and most European countries have outlawed it entirely. [contradictory] In other countries,[which?] while not restricted by law, homeschooling is not socially acceptable or considered desirable[why?] and is virtually non-existent. Reasons for people choose to homeschool are sometimes lifestyle choices, some people choose to home educate so that they can travel and spend better time with their kids. Some children learn differently to the general crowd and can get bored or can struggle at school, where the teachers are unable to cater for the individuality of each child. Homeschooling requires government registration, with different requirements from state to state. Some home educators prefer to be regulated, but others question whether the government has any legitimate authority to oversee the choices parents make to raise and educate their children. Curricular help is offered by the Australian Government. Homeschooling in South America has not taken hold as it has in North American countries of Canada and the United States. In 1824, Brazil permitted home education to take the place of traditional education for nearly 70 years. Many proposals were made in regards to the homeschooling regulations, but many of them were rejected. In 1990, however, The Statute of Children and Adolescents, or the Estatuto da Criança e Adolescente, prohibited homeschooling and did not recognize it as a legitimate form of education. A resurgence in the homeschooling movement, however, has encouraged congressman Lincoln Portela to introduce a new bill in 2013 that would allow children to be educated at home if parents followed state approved guidelines. The National Association of Home Education was founded in 2010 to achieve these goals. Rough estimates state that around 3,201 families are homeschooling in 2016. In 2018 the Supreme Court ruled that homeschooling was illegal, due in part to a lack of legislation regulating the practice. Homeschooling is legal in all provinces and territories in Canada and has been for 40 years. The Ontario Education Act, for example, states in Section 21(2)(a) that "A person is excused from attendance at school if [...] the person is receiving education elsewhere". Canada is known as having some of the most comprehensive legal protections for homeschooling parents in the Americas. Some provinces have implemented policies that require parents to notify school boards of their decision to homeschool. Every province requires parents to notify the school system of their intent to withdraw their child from the public school system and to begin home education. Five of ten provinces additionally require parents to submit a detailed curriculum to the state. Seven of these provinces do not require the program to be monitored by the school board or other private school administrators, and only five provinces require routine inspection of home education. These policies, however, are not law; although Canadian legislators recognize the importance of state controls in the homeschooling environment, it is ultimately up to the parent to decide when and how to homeschool. Despite a positive environment that supports and encourages alternatives to traditional schooling, it is estimated that less than 0.5% of Canadian families were homeschooling in 2015. This number is probably inaccurate, however, as many parents do not report their decisions to homeschool. Homeschooling is legal in Israel, and requires acquiring a permission from the Ministry of Education. The permission involves a home visit from the person in charge of handing out the permissions, and writing a letter describing the motives, curriculum, daily routine and socialization of the children. Unschooling is legal, and the requirements are minimal. The reasons for homeschooling in Israel are very similar to those of the rest of the world, with the exception of religious motives, since religious schools are prevalent. There is unclear information regarding the number of Homeschooling families, since not all families ask for permission, and many homeschool their children without enlisting. Estimates range between 500–1000 families. Up until 1920, homeschooling in Germany was seen as an acceptable practice under certain circumstances. With the rise of the Weimar Republic and the Nazi regime, homeschooling was seen as an anti-nationalistic and subversive practice that could undermine children's loyalty to their country. The Reichsschulpflichtgesetz, implemented in 1938, effectively banned all homeschooling with criminal consequences for anyone found practicing. Homeschooling wouldn't become a public concept until the 1980s. In 1989, Helmut Stücher removed his children from the public school system to begin home schooling. Stücher and others who followed suit were fined, and some even lost child custody. It wasn't until the unification of Germany in 1990 that education law was reformed and homeschooling was allowed, but only under strict observation and extreme circumstances. There is no general exemption for religious or pedagogical reasons; exemptions are allowed for severe illness, children of diplomats, ad rarely for working children such as actors. Germany has not endorsed homeschooling as other countries have. Its neighbors, Switzerland and Austria, have embraced the notion and are following similar paths as the United States and Canada. Home education was outlawed in apartheid-era South Africa before 1994, and families were jailed for not sending their children to school. Most of the parents who were jailed have criminal records because of this. With the acceptance of the South African constitution in 1994, home education was legalised per implication. This was acknowledged with promulgation of the SA Schools Act of 1996 in which home education is accommodated in art. 51. Since home education was legalised, it has grown exponentially. According to the census count of 2011, there were about 57 000 home learners in the country, putting South Africa in the top five countries in terms of number of home learners. ^ "Elective home education—Guidelines for local authorities" (PDF). gov.uk. Section 1.2. p. 3. Retrieved 2018-10-11. ^ "Informal learning, home education and homeschooling (home schooling)". YMCA George Williams College. Retrieved 2014-08-04. ^ Rothermel, Paula. International perspectives on home education : do we still need schools?. ISBN 978-1137446848. ^ Bhopal & Myers, Kalwant, Martin (2018-05-02). Home schooling and home education : race, class and inequality. ISBN 978-1138651340. ^ a b "The NCES Fast Facts Tool provides quick answers to many education questions (National Center for Education Statistics)". nces.ed.gov. Retrieved 2017-08-23. ^ a b Anderson, Melinda D. (2018-05-17). "The Radical Self-Reliance of Black Homeschooling". The Atlantic. Retrieved 2018-07-02. ^ "Education: Free and Compulsory". Mises Institute. Retrieved 19 April 2016. ^ Houston, Robert (2011-11-28). "Literacy". Retrieved 2017-09-13. ^ "History of Alternative Education in the United States". Retrieved 19 April 2016. ^ Encyclopædia Britannica 11 ed. Vol. 8 (Demijohn to Edward the Black Prince). p. 959. ^ "How they were schooled". Retrieved 19 April 2016. ^ "Removing Classrooms from the Battle | SUTHERLAND INSTITUTE" (PDF). SUTHERLAND INSTITUTE. 2008-07-29. p. 377,386 Note 30. Retrieved 2017-08-23. ^ Edgar, William (January 2007). "The Passing of R. J. Rushdoony". First Things. Archived from the original on April 4, 2014. Retrieved 2014-04-23. ^ "Raymond & Dorothy Moore: Homeschool Pioneers". CCHE. 2018-09-18. Retrieved 2019-04-10. ^ "HSC - A Brief History of Homeschooling". 2007-12-15. Archived from the original on 2007-12-15. Retrieved 2017-08-23. ^ a b "A Conversation with John Holt - The Natural Child Project". Retrieved 19 April 2016. ^ "A Conversation with John Holt - The Natural Child Project". www.naturalchild.org. Retrieved 2017-04-04. ^ "Moore Home Schooling : Moore Formula". www.moorefoundation.com. Archived from the original on 2016-03-05. Retrieved 2017-04-04. ^ "Reasons Parents Homeschool". Coalition for Responsible Home Education. 2013-09-11. Retrieved 2016-05-15. ^ HSLDA. "Homeschooling in New York: A legal analysis" (PDF). Retrieved 13 September 2013. ^ "Unschooling and Homeschooling FAQ | Alternative Schooling | Self Directed Learning". John Holt GWS. Archived from the original on 2015-07-07. Retrieved 2015-07-16. ^ "12 Most Compelling Reasons to Homeschool Your Children". 12most.com. 2012-02-07. Archived from the original on 2012-02-09. Retrieved 2014-01-16. ^ a b "Homeschooling in the United States: 2003 - Executive Summary". Retrieved 19 April 2016. ^ "HSLDA - Home Schooling-State". Retrieved 19 April 2016. ^ Livingstone, D. W. (2006). "User Verification | University of New Hampshire Library". Counterpoints. 249: 203–227. JSTOR 42979596. ^ Crawford, Elizabeth Outlaw; Heaton, Emily T.; Heslop, Karen; Kixmiller, Kassandra (2009). "User Verification | University of New Hampshire Library". Yc Young Children. 64 (6): 39–41. JSTOR 42731048. ^ "User Verification | University of New Hampshire Library". search.ebscohost.com.libproxy.unh.edu. Retrieved 2018-11-29. ^ Bolin, Inge (November 2006). "Growing up in a Culture of Respect: Child Rearing in Highland Peru". Journal of Latin American Anthropology. 11 (2): 430–432. doi:10.1525/jlca.2006.11.2.430. ISSN 1085-7052. ^ Legare, Cristine H.; Sobel, David M.; Callanan, Maureen (October 2017). "Causal learning is collaborative: Examining explanation and exploration in social contexts". Psychonomic Bulletin & Review. 24 (5): 1548–1554. doi:10.3758/s13423-017-1351-3. ISSN 1531-5320. PMID 28744768. ^ Martin-Chang, S.; Gould, O. N.; & Meuse, R. E. (2011). "The impact of schooling on academic achievement: Evidence from homeschooled and traditionally schooled students". Canadian Journal of Behavioural Science. 43 (3): 195–202. doi:10.1037/a0022697 – via proquest.com. ^ Randle, Inga (1997). "The measure of success: Integrated Thematic Instruction". The Clearing House. 71 (2): 85. ^ "Homeschooling Approaches - School-at-Home". www.homeschool.com. Retrieved 2017-10-24. ^ Gray, Peter (April 15, 2017). "Self-Directed Education—Unschooling and Democratic Schooling". Oxford University Press. doi:10.1093/acrefore/9780190264093.001.0001 (inactive 2019-02-17). Retrieved September 18, 2018. ^ "Why is education important, homeschooling and the Montessori method". Archived from the original on 5 February 2016. Retrieved 19 April 2016. ^ "What is Unschooling?". www.educationcorner.com. Retrieved 2019-03-18. ^ John Taylor Gatto, Weapons of Mass Instruction (Odysseus Group, 2008). ^ L. W. Chiu, Hazel (2012). "Supporting the development of autonomous learning skills in reading and writing in an independent language learning centre". Studies in Self-Access Learning Journal. 3: 271–272. ^ "CHN - Homeschool FAQ". californiahomeschool.net. Retrieved 2016-10-05. ^ a b "HSLDA - Academic Statistics on Homeschooling". Retrieved 19 April 2016. ^ "Academic Achievement". HSLDA. Retrieved 12 October 2012. ^ "Achievement and Demographics of Home School Students". Education Policy Analysis Archives. Retrieved 12 October 2012. ^ "HSLDA - Home Schooling Achievement". Retrieved 19 April 2016. ^ a b c Ray, Brian. "Progress Report 2009: Homeschool Academic Achievement and Demographics". Survey. National Home Education Research Institute. Archived from the original on 2013-01-05. Retrieved 6 January 2013. ^ Welner, Kariane Mari; Kevin G. Welner (11 April 1999). "Contextualizing Homeschooling Data: A Response to Rudner". Education Policy Analysis Archives: Education Policy Analysis Archives - Arizona State University. 7 (13). Retrieved 13 September 2013. ^ Martin-Chang, Sandra; Gould, O.N. ; Meuse, R.E. (2011). "The impact of schooling on academic achievement: Evidence from home-schooled and traditionally-schooled students". Canadian Journal of Behavioural Science. 43 (3): 195–202. doi:10.1037/a0022697. Retrieved 7 January 2013. ^ Ray, Brian. (2010). Academic achievement and demographic traits of homeschool students: a nationwide study. Academic Leadership Live: The Online Journal, 8(1). ^ Vaughn, Michael G.; Salas-Wright, Christopher P.; Kremer, Kristen P.; Maynard, Brandy R.; Roberts, Greg; Vaughn, Sharon (2015). "Are homeschooled adolescents less likely to use alcohol, tobacco, and other drugs?". Drug and Alcohol Dependence. 155: 97–104. doi:10.1016/j.drugalcdep.2015.08.010. PMC 4652803. PMID 26338482. ^ Daniel Golden (11 February 2000). "Home-Schooled Kids Defy Stereotypes, Ace SAT Test". The Wall Street Journal. Archived from the original on January 18, 2010. ^ Stevens, Mitchell L. (2001). Kingdom of Children: Culture and Controversy in the Homeschooling Movement (PDF). Princeton University Press. ISBN 9780691114682. ^ Sizer, Bridget Bentz. "Socialization: Tackling Homeschooling's "S" word". Pbsparents. ^ "HSLDA - Homeschooling Grows Up". Retrieved 19 April 2016. ^ "Rob Reich". Stanford.edu. Archived from the original on 10 September 2013. Retrieved 13 September 2013. ^ Reich, Rob. (2002). The Civic Perils of Homeschooling. Educational Leadership. 59(7). p 56. ^ Cheng, Albert. (2014). Does Homeschooling or Private Schooling Promote Political Intolerance? Evidence From a Christian University. Journal of School Choice International Research and Reform p 49-68. ^ "ERIC/CEM - School Choice Discussion". Archived from the original on 14 November 2007. Retrieved 19 April 2016. ^ Rose, Lowell C.; Alec M. Gallup; Stanley M. Elam (1997). "The 29th Annual Phi Delta Kappa/Gallup Poll of the Public's Attitudes Toward the Public Schools". Phi Delta Kappan. 1. 79: 41–56. ^ Gallup, Alec M.; Elam M. Stanley (1988). "The 20th Annual Gallup Poll of the Public's Attitudes Toward the Public Schools". Phi Delta Kappan. 70 (1): 33–46. ^ Spiegler, Thomas (2003). "Home education in Germany: An overview of the contemporary situation" (PDF). Evaluation and Research in Education. 17 (2–3): 179–90. doi:10.1080/09500790308668301. Archived from the original (PDF) on 2008-09-10. ^ "Home-school ban in Sweden forces families to mull leaving". The Washington Times. July 18, 2010. Retrieved 28 July 2013. ^ a b c "FAQ's". www.hea.edu.au. Retrieved 2016-05-15. ^ "Homeschooling in Brazil". The Brazil Business. Retrieved 2018-12-19. ^ "Homeschooling in Brazil". The Brazil Business. Retrieved 2016-12-02. ^ "Audiência discute projeto que autoriza o ensino domiciliar no Brasil". www2.camara.leg.br (in Portuguese). Retrieved 2019-01-13. ^ "Educação domiciliar ganha força no Brasil e busca legalização". Gazeta do Povo (in Portuguese). Retrieved 2016-12-02. ^ "Brazilian Supreme Court Outlaws Homeschooling". Folha de S.Paulo. 2018-09-13. Retrieved 2019-01-13. ^ "Law Document English View". Ontario.ca. 2014-07-24. Retrieved 2016-12-02. ^ a b c Deani Neven Van Pelt (2015). Home Schooling in Canada: The Current Picture—2015 Edition. Barbara Mitchell Centre for Improvement in Education. Fraser Institute. ^ "Canadian Home Based Learning Resource Page". www.flora.org. Archived from the original on 1998-05-29. Retrieved 2016-12-02. ^ "Israel Home Education—FAQ". 2016-08-29. ^ J.D., 2010. HOMESCHOOLING IN GERMANY AND THE UNITED STATES. James E. Rogers College of Law The Catholic University of America. Arizona Journal of International and Comparative Law. ^ Grunau, Andrea; Schumacher, Elizabeth. "European court rules against German homeschooling family". Deutsche Welle. Retrieved 10 January 2019. ^ "Homeschooling verboten". www.german-way.com. Retrieved 2016-12-02. Holt, John (2004) . Instead of Education: Ways to Help People Do Things Better. Boulder, CO: Sentient Publications. ISBN 978-1-59181-009-4.